If you are planning on making the stunning road trip along the length of Route 66, then you will have plenty of opportunities to enjoy the culture and the atmosphere in the towns that you will pass through along the way. There are plenty of chain hotels and motels to be found along the route, but to really get a taste for the people along the journey, nothing beats staying at one of the smaller and more welcoming mom-and-pop places that really have a history. Whether you are staying every night along the way, or you are taking an RV and just want a few stops to give you a more comfortable stay for a night or two, here are some of the best family run establishments along Route 66. This motel has been a fixture in Kingman since the 1950s, and current owner Dennis Schroeder has been running the place since 1981, modernizing some of the decor and the technology while maintaining the charming atmosphere. The motel has a swimming pool and a lovely panorama of the nearby mountain range and has rooms for those traveling with dogs, along with a laundry room and large comfortable beds to provide a respite after a day on the road. Another historic classic on the route, this motel was built in 1939 by businessman Arthur Boots, who gave his name to the motel and opened up the simple but comfortable rooms that made up the motel. The atmosphere here is very retro, and instead of a TV in every room there is a radio to give a lovely old time atmosphere, and with its authentic neon sign and retro decoration, it is a truly lovely place to stay, with owners who really know and love the motel and the local area. You won't be able to miss this one as you drive through downtown Lebanon, as the huge retro neon sign has been restored and looks amazing as you approach the motel. Owned by Bob and Ramona Lehman, Ramona has decorated all of the rooms personally, and while it maintains a retro atmosphere, there are also some modern features such as wireless internet, and a good selection of Route 66 memorabilia available too. Set a good distance from other accommodation with several miles in each direction to the next town, many people will stumble on this motel as they travel through Oklahoma, but its themed rooms and inexpensive prices mean that many people will find it to be a great surprise. The rooms are themed to different subjects including Elvis and a 'Safari' room, but it is a fun place to stay, and the welcome from the couple is warm and friendly. 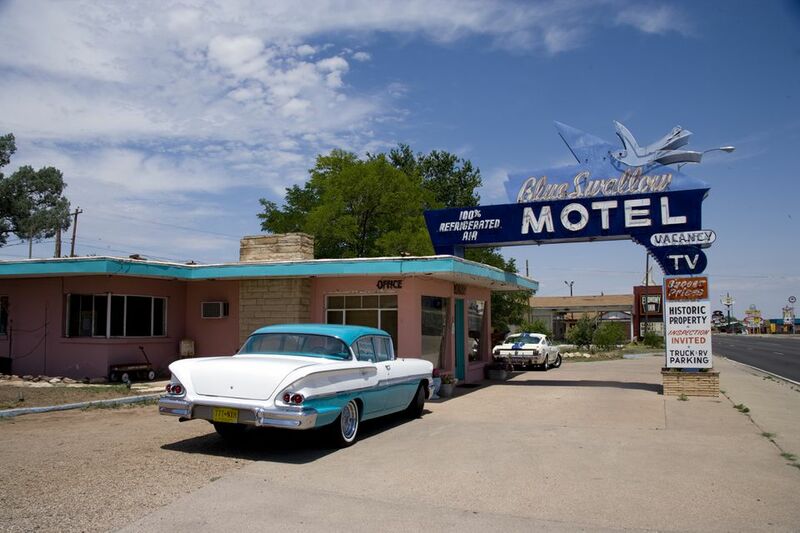 A family run motel, the Blue Swallow is one of the icons of the 'Mother Road' with its distinctive neon sign with a depiction of the bird, along with a real authentic atmosphere that dates back to the 1940s and 1950s when the road trip was in its heyday. Today modern features such as charging points for electric vehicles, wireless internet and modern mattresses on large beds help to make this a comfortable as well as beautiful place to stay. The same family has owned this vintage motel since it was first opened in the 1930s, and the Campos family still provide that warm welcome to visitors today. Traditional wood paneling in the rooms and traditional furniture in good repair help to give the motel a good retro atmosphere, while it is also a comfortable and convenient place to stay. The quiet town of Vega is one of the places you will come across along Route 66, and this small motel is one that has architecture typical of the whole town, with low single story units with simple but comfortable furnishings. The bathrooms with their original pink tile work are also quite interesting and are a relic from an earlier time. The town of Williams is the starting point for the Grand Canyon railway, so stopping here makes perfect sense if you intend to take the day trip up to the most famous natural attraction in the country. This motel offers value for money and traditional motel rooms with a simple bed and bathroom, while the rooms are also quite spacious.